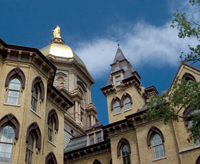 The University of Notre Dame is hosting its eighth annual Fulbright Foreign Language Teaching Assistant (FLTA) orientation for the coming academic year, bringing foreign language teachers from 28 countries to campus August 5 through 8 for a series of workshops designed to enhance their teaching in the United States. The program also will introduce them to important features of American culture in preparation for their teaching experiences across the country. Most of the scholars participating in this year’s orientation have never been to the U.S. and will participate in workshops covering everything from how to prepare a syllabus to the rules of American football. See the schedule of events for a complete list of workshops as well as other orientation details. Notre Dame is one of only five universities selected by Fulbright and the U.S. State Department to host such an orientation. Upon completion, the teachers will travel to their host institutions, where they will teach undergraduate foreign languages. “Hosting this event not only places Notre Dame at the center of Fulbright’s foreign language program, but it underscores our leadership and accentuates our expertise and reputation as foreign language teachers,” says Brian Ó Conchubhair, orientation director and associate professor in the University’s Department of Irish Language and Literature. The FLTA participants come from Afghanistan, Algeria, Argentina, Brazil, China, Egypt, France, Germany, Indonesia, Ireland, Japan, Jordan, Kenya, Korea, Libya, Mauritania, Morocco, Nigeria, Oman, Russia, Senegal, Spain, Taiwan, Tanzania, Tunisia, Turkey, Uruguay, and Yemen. The orientation is organized and funded by the Fulbright Commission, the U.S. Department of State’s Bureau of Educational and Cultural Affairs, and the Institute of International Education. Originally published at news.nd.edu .